Make Friends with your Smartphone–go on a Date! So we got together one day and Mary Helen brought her phone, and her list of questions and we started to chat. Since it was such a beautiful day outside I suggested we go for a walk. We brought our phones along and I turned on Runkeeper so my phone could tell us how far and how fast we walked – that helped me explain the GPS capabilities in the phone. As we walked, I pointed out the nearby cell tower and explained the different ways our smartphones are connected. I asked her questions to check that she was understanding my meaning and she answered with an excited enthusiasm. The more you understand about how something works, the easier it is to learn how to use it. When we got back to the house, Mary Helen got out her list of questions and we started going thru them. How do I stop it from beeping every time I get a new email? How do I set a unique ringtone for when I receive a Text message? How do I set a picture on a person’s contact info? How do I get all my email accounts delivered to one single inbox? How do I take a picture and email it to a friend? How do I keep the screen from turning off after only 30 seconds? How do I get Apps, and what Apps should I get? After a while I was hungry, so I suggested we go out to lunch. I showed her how to use her phone to Navigate to California Pizza Kitchen. 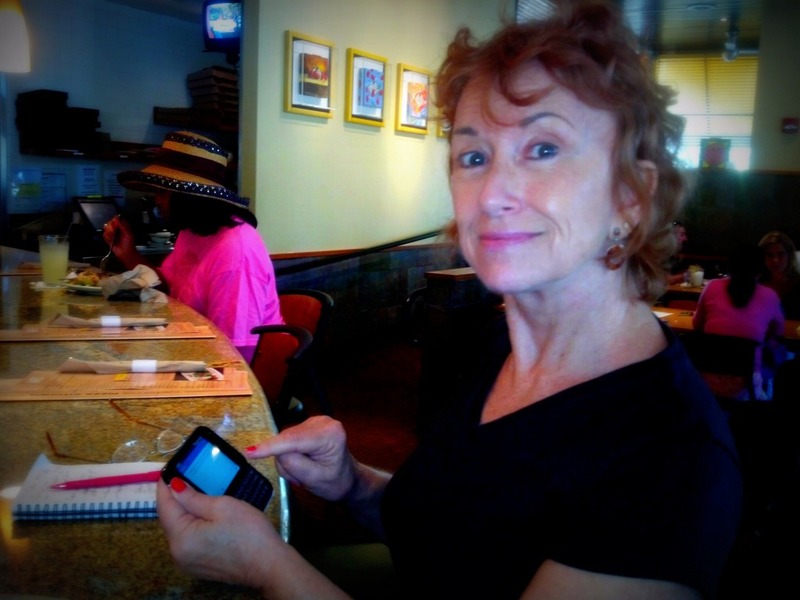 Once we got there and ordered their delicious chopped salads … and a glass of wine … I showed her how to use her phone to write a post on Facebook and ‘Check In’ to California Pizza Kitchen. I took a picture of her and posted that, making sure to tag it with her name so it showed up on her News Feed as well. I showed her how to download a barcode reader App and scan the square QR code on the menu to find out more information about the restaurant. This was really fun! And I could tell that she was getting more comfortable with her phone. When we finished, Mary Helen said, ‘You know, you could market this. Do private lessons like this instead of in a class.” hmmm, what a great idea! What do we call it? How about going on a Date with your Smartphone? And, I’m the chaperone! I don’t know what we’ll charge yet, but you can bet it will be reasonable – especially if you pay for lunch! Published by MrsGeek, in Blog. Tagged with smartphone lessons. Glad to see you enjoyed your day with the smart phone. I have also joined the Smart Phone world and added a new subject to the teachers lounge “New to Smart Phones” I do not thing Chris or Jim have had a chance to look at it the Driod section of the form seemed to have pettered out. Hope we can make it a subject of intrest. Chris, you were great! I felt like such a dummy before, especially since it seemed everyone could use a “smart phone.” But you know…I bet there are a lot of people out there like me…forced to keep up with technology. Instead of resenting this fact…I am excited about all the possibilities with its’ use!